A Paleo diet makes many people much more aware of how the foods they eat affect their body – without the constant low-level gut problems caused by unhealthy modern foods, occasional digestive issues are much more noticeable. But not all stomachaches are created equal – a food allergy, a food intolerance, and a negative reaction to food toxins are three different problems, and it’s important to understand the distinction, to help you quickly identify and avoid the foods that are causing you problems. If you tell someone that you’re “lactose-intolerant,” one of the first questions is likely to be, “so…you’re allergic to milk?” But while an allergy and an intolerance both make you feel sick, they’re actually two completely different biological issues. An allergy is a problem caused when IgE antibodies in your immune system mistakenly think that a harmless substance (like pollen or cat hair) is actually dangerous. Trying to defend your body, these IgE antibodies trigger the release of histamine, which provokes an inflammatory response to get rid of the “threat.” You sneeze when you have a cold because your body is trying to get rid of the germs; you sneeze when you have an allergy because your body thinks cat dander is a kind of germ. Sometimes, this response is nothing but an inconvenience: hayfever isn’t fun, but it’s also not a serious problem. On the other hand, some allergies cause a life-threatening condition called anaphylaxis – peanut allergies are so notoriously severe that several schools have banned peanuts altogether. While allergies are all biologically similar, intolerances have a much greater variety of causes. In general, allergies are problems with the immune system, while intolerances are problems with the digestive system, but the term “intolerance” is really more of a catch-all label. If a food makes you sick, but you don’t have the specific IgE allergic response, it’s probably an intolerance. Lack of certain enzymes can cause a food intolerance, as is the case with lactose intolerance (caused by a deficiency of the enzyme lactase). Mabasorption in the gut, immune problems that don’t have to do with IgE antibodies, or metabolic disorders like diabetes are also common culprits. Other medical conditions like Irritable Bowel Syndrome (IBS) or Small Intestinal Bacterial Overgrowth (SIBO) can provoke a reaction to a wide variety of foods. One common problem that many people with IBS suffer from is FODMAPs intolerance. FODMAPs (Fermentable Oligosaccharides, Disaccharides, Monosaccharides And Polyols) are small carbohydrates that are not completely absorbed in the small intestine, and are easily and quickly fermented by the gut flora. This can cause bloating, gas, and abdominal pain – if you have SIBO as well, the excess gut flora will only make the symptoms worse. Even foods that are perfectly acceptable on Paleo can be problematic if you’re FODMAPs intolerant: foods high in FODMAPs include certain kinds of fruit (apples, mango, pears, and watermelon), milk, and some vegetables (like asparagus, broccoli, and onions). Unfortunately, coconut can also cause problems for people who are sensitive to FODMAPs, as can most kinds of nuts. Eating FODMAPs won’t cause a healthy person to develop IBS or SIBO, but for people who are already sick, they’re a common source of problems, and even some healthy people find that their digestion improves when they stop eating foods high in FODMAPs. If you do suffer from IBS or Crohn’s disease, eliminating FODMAPs from your diet won’t cure the underlying problem, but it can help control the symptoms. One food intolerance can also beget another: most commonly, gluten intolerance can create other problems when gluten damages the lining of your intestinal tract, allowing molecules of food to pass from your gut directly into your bloodstream. The resulting “leaky gut” symptoms allow all kinds of foods to pass through the intestinal lining. Since foreign bodies of any kind in the bloodstream trigger an autoimmune reaction, your immune system will create antibodies against all of these foods. Thus, you appear to have problems with wide variety of foods, but in fact, the only real issue is the gluten. If gluten weren’t giving you a leaky gut to begin with, none of the other foods would cause any problems. This is why many people suffering from Celiac disease or gluten intolerance find that they no longer have problems digesting dairy after cutting gluten out of their diet. Since they have so many causes, and so many different symptoms, food intolerances are often not recognized correctly or misdiagnosed as allergies. Adding to the confusion, the symptoms of food intolerances are often chronic, rather than severe. If you immediately break out in hives and start to have trouble breathing after eating peanuts, it’s not hard to connect the trigger food to the reaction. But if you’re suffering from persistent, low-level digestive problems that don’t become noticeably better or worse after eating any specific food, it might not be easy to connect those symptoms to fructose malabsorption, salicylate intolerance, or another very general problem that involves many different foods. Sometimes, a very small amount of a food you’re intolerant to might not cause a noticeable reaction, leading you to mistakenly believe that the food is safe. This makes food intolerances frustrating to live with, and even more frustrating to diagnose. Allergies and intolerances cause you to have a reaction to a food that isn’t necessarily dangerous for everyone. Someone with an egg white allergy, for example, cannot eat eggs because of their particular allergy, not because eggs are inherently unsafe for people to eat. 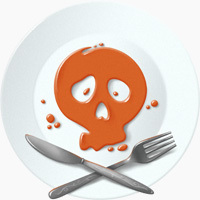 Food toxins, on the other hand, are substances that are harmful to everyone. Basically, toxins are substances that all humans are intolerant to, just because of the way our digestive systems function. Many toxins – like gluten, lectins, saponins, and phytic acid – are found in legumes, grains, and pseudograins. Other toxins end up in ordinarily harmless food from the environment: pesticides, herbicides, hormones, and other chemicals can leak into the food and water supply all too easily. It is possible to be allergic or strongly intolerant to one or more of these food toxins, but toxins are still harmful even to people who don’t notice an immediate allergic reaction. For example, someone with a peanut allergy has a severe anaphylactic reaction that will strictly prevent them from ever eating peanuts, but even for someone without an allergic reaction, peanuts are still a problematic food because they contain toxins like phytic acid. These toxins can cause a wide range of problems, from acne to leaky gut to hormone imbalances; many of these problems are cumulative, meaning that they sneak up on you over the years, without one clear cause. This is why so many people are surprised at how much better they feel on Paleo: they didn’t realize they were sick until they cut toxins out of their diet. To demonstrate the differences between all these digestive problems, let’s look at wheat as an example. Like other grains, wheat is not part of Paleo because it’s a product of the Agricultural Revolution, and the human digestive system hasn’t fully adapted to processing it. It contains several toxins, including gluten, lectins, and phytic acid. These harmful compounds cause gut inflammation and irritation, leaky gut, and a cascading series of autoimmune and digestive problems. Since toxins are harmful for everyone, all of us should avoid wheat, but some people have even more serious allergic reactions or intolerances to it. Many people think that Celiac disease, gluten intolerance, and an allergy to wheat are the same problem; in fact, however, these are three different issues. You can be gluten intolerant without having Celiac disease, and a wheat allergy is an entirely separate problem. Celiac disease is a genetic intolerance of gluten that affects approximately 1 in 130 people. 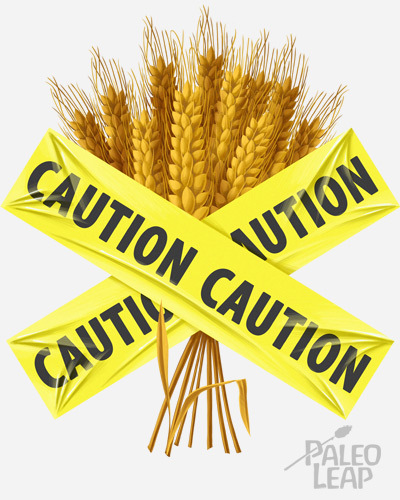 Although it does cause problems with the immune system, Celiac disease is not the same problem as a wheat allergy. First, allergies involve the IgE antibodies, while Celiac disease does not. If you have Celiac disease, one specific protein (gluten) provokes an autoimmune response in the small intestine, causing your gut to attack itself. This destroys the villi (the tiny hairs that line your intestine), perforates the lining of your gut (“leaky gut” syndrome), and prevents you from absorbing all the nutrients in your food. On top of the digestive and autoimmune symptoms, Celiac disease can also cause a rash called Dermatitis Herpetiformis, but it does not cause anaphylaxis the way an allergic reaction would. If you have a wheat allergy, on the other hand your immune system reacts to one or more of four different proteins (albumin, globulin, gliadin, and gluten) as a threat. For someone with a wheat allergy, eating wheat can cause the typical “allergy symptoms” like hives, a runny nose, or even anaphylactic shock, as well as more obvious digestive problems. Additionally, Celiac disease is inherited, while wheat allergies are not. Celiac is a lifelong problem; wheat allergy is most common in children, and many children grow out of it. Also, Celiac Disease requires the avoidance of all gluten grains (wheat, barley, and rye), while people with wheat allergies don’t need to avoid anything but wheat itself. Thus, Celiac Disease and wheat allergies might have similar symptoms, but in reality they’re two very different conditions. Furthermore, even if you don’t have Celiac disease, you can still have non-celiac gluten sensitivity. Non-Celiac gluten sensitivity is usually less severe than Celiac disease; for example, the symptoms do not always include leaky gut. Celiac can be life-threatening, but non-Celiac gluten intolerance usually isn’t. The two problems also involve different parts of the immune system, and provoke different responses (if you have Celiac disease, your gut attacks itself; if you’re non-Celiac gluten intolerant, your immune system attacks only on peptide, gliadin, in gluten itself). Since allergies, intolerances, and food toxins can do so much damage, most people want to avoid their effects as much as possible. The way to prevent damage from toxins is fairly simple: don’t eat them. The list below shows the most common food and environmental toxins. Everyone should avoid these – think of them as foods that all of us are intolerant or allergic to. Even if you don’t notice an immediate reaction from eating them, preventing the long-term health damage is worth the effort. Unfortunately, this is much easier said than done: it’s one thing to cut out grains and legumes, but almost impossible to protect yourself from the chemical soup in your drinking water, or the pesticides that might be sprayed into the air you breathe. But as difficult as it is to escape them, it’s important to avoid toxins as much as you possibly can. Toxins are harmful to everyone, but since allergies and intolerances don’t affect everyone, there’s no need to start avoiding non-toxic foods if you don’t react to them. Many people are allergic to shellfish, but that doesn’t mean you should automatically eliminate them without any proof that they’re causing you problems. But if you’re still having digestive symptoms after you’ve cut toxins out of your diet, an allergy or intolerance is a likely suspect. The list below shows the most common foods that people are allergic or intolerant to, to give you a starting point for your research. Unfortunately, the tests for determining what foods you might be reacting to aren’t very good, and can sometimes seem even more confusing than the problems they’re supposed to solve. For food allergies, doctors can use a tool called an ELISA test or a RAST test for IgE (Immunoglobulin E, the antibody involved in allergic reactions) in the blood; ideally, this is done immediately after the patient eats a small amount of the suspect food. If there are IgE antibodies in your blood after you eat the food, it’s a sign that your immune system is trying to attack it, which means you’re probably allergic. Your doctor can also administer a skin test by scratching your skin with an extract of the food you might be allergic to. If you are allergic, your immune response to the allergen will cause a bump and an inflamed area at the injection site. These tests, however, are frequently inaccurate: a positive skin test doesn’t necessarily mean that you’ll have problems eating the food, and a negative skin test doesn’t necessarily mean you won’t. An ELISA test can also be useful in determining intolerances: although they do not involve IgE, doctors can administer an ELISA test for two other kinds of antibodies, Immunoglobulin G (IgG) and Immunoglobulin A (IgA). These tests, however, are not very reliable and often deliver false positives. To test for intolerance to some FODMAPs, you can also take a breath test, but this won’t give you an answer for all of them. The method that most doctors accept as best is called an Elimination and Challenge test: after the patient eats a very restricted diet for 3-6 weeks, a doctor slowly introduces potential problem foods, noticing any side effects or reactions. Since this involves a diet so restricted that it might cause nutrient deficiencies, and since many people have very bad reactions when the foods they are intolerant to are reintroduced, this kind of test should only done under medical supervision. If you don’t have the resources to have a full battery of tests done, you can also try a self-diagnosis with an elimination diet: starting with the common problem foods in the list above, eliminate foods from your diet until you have no more symptoms, and then reintroduce them one at a time. When your symptoms reappear, you’ve found the problem! You might have to repeat this experiment with several groups of food, if you have more than one allergy or intolerance. Living with a bad reaction to one or more foods requires special attention to everything you eat. Packaged foods are generally suspect on Paleo, because manufacturers have a way of sneaking in soy products, artificial flavors and colors, and all kinds of preservatives. But if you do have an allergy or intolerance, you’ll need to be even more careful with any kind of packaged or prepared food. In the US, food manufacturers are required to label 8 common allergens: milk, eggs, fish, shellfish, tree nuts, peanuts, wheat, and soybeans. Other foods that commonly cause problems, however, are not always labeled – if you have an allergy or intolerance to anything not in the top 8 list, you’ll need to be especially careful about reading labels and staying aware of what foods might cause a reaction. Certain allergies and intolerances can also require you to change more than just your diet – salicylates, for example, are common ingredients in soaps and shampoos as well as fruits and some nuts; if you’re intolerant to salicylates, you might need to pay as much attention to your bathroom as your kitchen. Very severe allergies may require you to carry an epinephrine autoinjector (EpiPen), which allows you to immediately inject yourself with a high dose of epinephrine if you accidentally eat something you are allergic to. This can be life-saving if you go into anaphylaxis far from a hospital. If your allergy is serious enough to send you into anaphylaxis, it’s a good safety precaution to always carry an EpiPen in case you accidentally eat something that’s been cross-contaminated (for example, if a food service worker forgets to change her gloves between someone else’s peanut butter sandwich and your tuna salad). As you spend more and more time on Paleo, you might notice that some of your allergies or intolerances begin to disappear, or at least become less severe. This might be because your gut is healing – as described above, the leaky gut symptoms caused by eating gluten can cause you to become intolerant of all kinds of other foods (most commonly dairy). When you eliminate gluten from your diet, and give your intestinal wall a chance to heal itself, the problems with some other foods might suddenly disappear. This requires some time and patience (it’s a good idea to wait a few months for your gut to fully heal before you start experimenting) but it’s always an exciting discovery to find that you suddenly can eat a food you thought you couldn’t. Diagnosing and living with food sensitivities or allergies can be difficult and frustrating, especially if you have an uncommon allergy that isn’t labeled on most food products. But be patient with yourself and our digestive system: get rid of food toxins first (whether or not you have an obvious reaction to them), and give your body a few months to heal before you try allergy testing for everything you can plug into Google and find a blog about. As you start testing yourself further, remember to leave enough time between tests to fully observe the results, and try not to get discouraged if you don’t find the culprit immediately. You’ll find it eventually – and when you do, you’ll be able to enjoy your newfound health and eat other foods joyfully and confidently.